RESIDENTS rose to the challenge and produced some fantastic entries for this year's Ponteland Parish Flower Show. 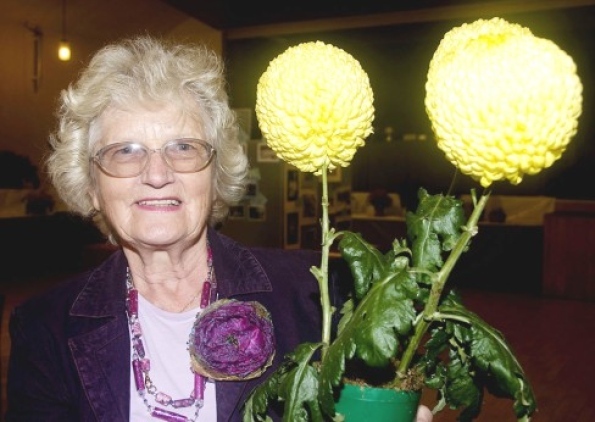 About 300 people came along to Ponteland Memorial Hall on Saturday to see the items – which included flowers, vegetables, handicrafts, fruit and photographs. The children's section was well supported and the display of entries of a flower decoration in an egg cup for the under nines was extremely colourful, making it a difficult one to judge. The display by the Ponteland Floral Art Club and the Callerton Garden and Flower Club illustrating film titles was extremely imaginative and it showed the high standard of local talent. After the prizes were handed out, there was an auction of produce and flowers to help pay for the show and start the fund-raising for next year's event. Show Chairman Syd Cowan said: "The day went very well and we were very pleased to see some new exhibitors, which seems to happen every year. The overall quality was once again excellent and this year the entrants had to cope with the challenge of summer weather in April and autumn weather in July and August. "I would like to thank the judges, stewards, voluntary show committee and Memorial Hall caretaker for their contributions to making this event a success. "We were also thrilled that the Mayor and Mayoress of Ponteland attended the show and helped with the presentation of trophies." Earlier this year, the show committee made a donation of £500 to the Memorial Hall after holding a Chinese banquet. Trophy and award winners – Ponteland Parish Council Challenge Salver for best pot plant: Basil Scott; Northumberland Fuchsia Society Trophy for best fuchsia: Ken Pleasants; Bobby Thompson Memorial Trophy for best hybrid tea roses: Mike Sadler; Alan Cowell Award for best hanging basket: Syd Cowan; Bob Woolley Award for best dahlias: Cranston Cuthbert; Ponteland Parish Council Challenge Rose Bowl for best cut flowers: Margaret Cowan; Bobby Thompson Memorial Trophy for best heather exhibit: Dorothy Warner; Bill Crow Memorial Quaich for most points in heather classes: Warners; Ponteland Parish Council Challenge Trophy for best exhibit in vegetables: Bob Butcher; Rotary Club of Ponteland Children's Trophy for best handwriting: Ashvee Shah; Ponteland Town Council Trophy for best Ponteland poem: Ellie Afflick-Ward; Ponteland Ladies' Circle Challenge Award for best exhibit in children's classes: Jessica Easton; Mary Anderson Shield for most points in children's classes: Kristin Morgan; Stanley C. Dytham Cookery Perpetual Challenge Trophy for most points in cookery classes: Irene Halliday; Margaret Dodsworth Championship Trophies (senior and junior) for best apple pies: Jean Sadler (senior) and William Pilsbury (junior); Thornhill Women's Institute Trophy for best exhibit in handicrafts: Jack Hetherington; Women's Institute Challenge Salver for most points in handicrafts: Maria Shuttleworth; Barbara White Memorial Trophy for best exhibit in art: Christine Forster; T. Geoffrey Willey Photographic Cup for best exhibit in photography: Mike Sadler. Flower classes – Pot plant (flowering): 1 Basil Scott, 2 C&D Butler, 3 Marion Prince; Pot plant (foliage): 1 Irene Bruce, 2 C&D Butler; One fuchsia: 1 Ken Pleasants, 2 and 3 Irene Bruce; One coleus: 1 and 2 Maria Shuttleworth; One cactus or succulent plant: 1 and 2 John Angel; One vase of mixed flowers: 1 Margaret Cowan, 2 David Goodchild, 3 Marion Prince; Three chrysanthemum blooms: 1, 2 and 3 Maria Shuttleworth; Three hybrid tea roses: 1, 2 and 3 Mike Sadler; One hybrid tea rose: 1 Mike Sadler, 2 Margaret Cowan, 3 Freda Hetherington; One stem floribunda rose: 1 Freda Hetherington; Hanging basket: 1 Syd Cowan, 2 Basil Scott, 3 Marion Prince; One gladiolus spike: 1 John Turner, 2 and 3 Mrs Porter; Three spikes of gladioli: 1 Marion Prince, 2 Syd Cowan, 3 Maria Shuttleworth; Three cactus dahlias (small): 1 and 2 Cranston Cuthbert, 3 David Goodchild; Three cactus dahlias (medium): 1 Maria Shuttleworth; Three decorative dahlias (min or small): 1 and 2 Cranston Cuthbert, 3 David Goodchild; Three decorative dahlias (medium): 1 and 2 Audrey Christie; One vase of seven dahlias: 1 Cranston Cuthbert, 2 Maria Shuttleworth, 3 Audrey Christie; One vase of mixed sweet peas: 1 and 2 Maria Shuttleworth, 3 Mike Sadler; One vase of five pinks: 1 Marion Prince; Four pansies: 1 Mike Sadler, 2 and 3 Syd Cowan; One saintpaulia: 1 Lucinda Porter; One Lady's spray: 1 Margaret Cowan, 2 Cranston Cuthbert, 3 Irene Straughan; One Gentleman's buttonhole: 1 Margaret Cowan, 2 and 3 Irene Straughan; Heathers (single, white): 1 John Turner, 2 Dorothy Wild, 3 D&G Warner; Heathers (single, coloured): 1 John Turner, 2 D&G Warner, 3 Dorothy Wild; Heathers (double, white): 1 R Nichols; Heathers (double, coloured): 1 and 2 D&G Warner, 3 R Nichols; Basket of heathers: 1 D Warner, 2 John Turner; Buttonhole made from heathers: 1 and 2 Dorothy Wild. Vegetable classes – Three beetroot: 1 and 2 J Hinchley, 3 Bob Butcher; One cabbage: 1 and 2 Bob Butcher, 3 C&D Butler; Two carrots (long): 1 and 2 Bob Butcher, 3 David Goodchild; Two carrots (stump or intermediate): 1 and 2 Bob Butcher, 3 David Goodchild; One cauliflower: 1 and 2 Bob Butcher; One cucumber (greenhouse, long): 1 C&D Butler, 2 Penny Hewitt; One lettuce: 1 John Hinchley, 2 Penny Hewitt, 3 Basil Scott; Two leeks (blanch): 1 and 2 Tony Murphy, 3 Basil Scott; Two leeks (not blanch): 1 Tony Murphy; One marrow (quality): 1 Kathleen Farquhar, 2 and 3 C&D Butler; One marrow (heaviest): 1, 2 and 3 J Hinchley; Two parsnips: 1 and 2 Bob Butcher; Three onions from seed: 1 Bob Butcher, 2 David Goodchild, 3 Bob Butcher; Three onions from sets: 1 Basil Scott, 2 and 3 Bob Butcher; Four onions weighing less than two pounds: 1, 2 and 3 Bob Butcher; Six shallots: 1, 2 and 3 Bob Butcher; Two courgettes: 1, 2 and 3 Sandy Christie; Five tomatoes: 1 and 2 Irene Bruce, 3 Mrs Porter; Nine cherry tomatoes: 1 Marion Prince, 2 and 3 Penny Hewitt; Six pods of peas: 1 and 2 Penny Hewitt; Six pods of runner beans: 1 Sandy Christie, 2 and 3 David Goodchild; Six pods of French beans: 1 and 2 Syd Cowan, 3 C&D Butler; Six pods of any other beans: 1, 2 and 3 Bob Butcher; Four potatoes (white): 1, 2 and 3 Bob Butcher; Four potatoes (coloured): 1, 2 and 3 Bob Butcher; Collection of potatoes: 1 Bob Butcher; Two globe turnips: 1 Sandy Christie; Four capsicums: 1 Marion Prince, 2 David Goodchild; Any other vegetables: 1 and 2 Syd Cowan, 3 Marion Prince; Vegetable collection (one each of three kinds): 1 and 2 Bob Butcher, 3 Tony Murphy; Basket of plenty: 1 David Goodchild, 2 and 3 Bob Butcher. Fruit classes – Apples (culinary): 1 Kathleen Farquhar, 2 Irene Straughan, 3 David Goodchild; Apples (dessert): 1 L Carter, 2 S Easton, 3 Grange Lea care home; Plums: 1 Audrey Christie, 2 C&D Butler, 3 L Carter; Any other fruit: 1 Audrey Christie, 2 Mike Sadler, 3 Irene Straughan; Grapes: 1 and 2 Christine Liddell, 3 Syd Cowan. Children's classes – Flower decoration in egg cup: 1 Alice Cowell, 2 Ellie Ridout, 3 Amelia Riley; Christmas tree bauble: 1 Molly Knowles, 2 Sophie Nesbitt, 3 Francesca Turnbull; Miniature garden: 1 Georgia Morrow, 2 Emma Renton, 3 Sophia Riley; An insect: 1 Isabella Hull, 2 Molly Storer, 3 Amy Sparshott; Textured picture: 1 Francesca Turnbull, 2 Sophia Riley, 3 Eve Ward; Handwriting (under seven years): 1 Ashvee Shah, 2 Sophie Johnson, 3 Gabriella Turnbull; Handwriting (seven to nine years): 1 Sophie Nesbitt, 2 Emma Fatkin, 3 Molly Knowles; A poem for Ponteland: 1 Ellie Afflick-Ward, 2 Katie Winters, 3 Sarah Smith; A decorated gift bag: 1 Kristin Morgan, 2 Anna Harris, 3 Alex Eden; FIMO or clay model: 1 Kristin Morgan, 2 Megan Winter, 3 Sophie Drew; Mr and Mrs Potato Head: 1 Katie Winters, 2 Alex Eden, 3 Katherine Wilkes; Three pieces of traybake: 1 Anna Harris, 2 Katie Winters, 3 Evie Austin; Apple pie: 1 William Pilsbury, 2 Amelia McKenna, 3 Kristin Morgan. Cookery classes – One jar of marmalade: 1 Mary Guy, 2 Penny Hewitt, 3 Syd Cowan; One jar of fruit jelly: 1 Penny Hewitt, 2 and 3 Jack White; One jar of jam: 1 and 2 Penny Hewitt, 3 Syd Cowan; One jar of lemon curd: 1 Penny Hewitt, 2 V Hinchley; One jar of chutney: 1 Syd Cowan, 2 Tony Murphy, 3 Jack White; Apple pie: 1 and 2 Jean Sadler, 3 Irene Halliday; Four jam tarts: 1 Penny Hewitt, 2 Irene Halliday; Sultana cake: 1 Ann Reid, 2 Irene Halliday, 3 Penny Hewitt; Sandwich cake: 1 and 2 Irene Bruce, 3 Penny Hewitt; Four cupcakes: 1, 2 and 3 Irene Halliday; Bread loaf: 1 Irene Halliday; Lemon meringue pie: 1 Irene Bruce, 2 Tony Price; Four ginger snaps/biscuits: 1, 2 and 3 Jean Sadler; Four cheese scones: 1 Irene Halliday, 2 Grange Lea care home, 3 Irene Bruce; Four pieces of traybake: 1 Ann Reid, 2 Grange Lea care home, 3 Joyce Rawlings. Handicraft classes – Hand-made toy: 1 Maria Shuttleworth, 2 Lucinda Porter, 3 Mary Guy; Item of beadwork: 1 and 2 Penny Morris; Hand-knitted article: 1, 2 and 3 Irene Bruce; Any other craft: 1 Maria Shuttleworth, 2 Marina Catchpole, 3 Maria Shuttleworth; Any other craft in wood: 1 Jack Hetherington; Embroidered article: 1 and 2 Maria Shuttleworth, 3 Betty Ladkin; Cross-stitch: 1 Wendy Trevitt; Quilted item: 1 Wendy Trevitt, 2 and 3 Maria Shuttleworth; Oil painting: 1 George Ridley, 2 Cranston Cuthbert; Water colour: 1 and 2 Christine Forster, 3 Jack Hetherington; Line drawing: 1 Jack Hetherington; Acrylic painting: 1 Mike Brown. Wines – White wine: 1 and 2 Syd Cowan, 3 Christine Forster; Red wine: 1, 2 and 3 Syd Cowan. Photography classes – Natural history: 1 Mike Sadler, 2 Annabel Andrews, 3 Mike Sadler; Family holidays: 1 Mike Sadler, 2 Kristin Morgan; Hobby: 1 Mike Sadler; Water: 1 Mike Sadler, 2 Don Foster, 3 Mike Sadler; Animal photo: 1 Jonathan Kellagher, 2 Mike Sadler, 3 Kristin Morgan; Children's snapshot (under nine years): 1 Rebecca Grezo, 2 Georgia Morrow, 3 Chloe Petts; Children's snapshot (nine to 14 years): 1 Harvey Robertson, 2 Evie Austin, 3 Kristin Morgan.